Dave's Beer: Not exactly snowbound, but a good workout. Not exactly snowbound, but a good workout. Just a light snow, but having eaten so much last night and this morning, decided to use the snow to get some exercise rather than going to the gym. 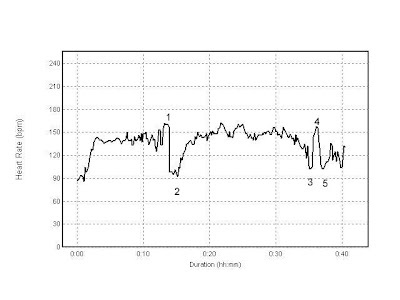 I used my Omron Smartsync heart rate logger to gather this data. Not a bad workout. Average HR of 136 for 40 minutes and, as you can see, totally interval. Peter, the csv is in the mail. I opted for a 10 second sampling rate to make the graph prettier. My name is Thomas Redmond and I am working with OhioHealth to find influential bloggers in the Columbus area to attend a tour of its healt-focused accomodations. The tour will include a free night to stay at Big Red's Lodges, so that you can get a feel for the whole experience. We are hoping to get people excited about the "Healthy Escape Weekends" at the facility, which is located next to the McConnell Heart Health Center on Olentangy River Rd. I have sent you a few emails with more detailed information. Since the event is on March 10, we would love to know if you will be able to attend or not.